Hannah More is one of the most incredible historical people I had never known about or studied. She was dedicated to educating women and the poor, was a recognized writer, fought to abolish slavery, and rubbed shoulders with many prominent men including David Garrick, Samuel Johnson, William Wilberforce, and Horace Walpole. Her influence is particularly astonishing considering her standing as an unmarried British women in the late 18th and early 19th centuries; and she was motivated by her great faith for God and His work of social justice. As interesting as I found this book, I would have like it to have been more story-oriented and less “text-book” style. I did not enjoy reading it so much as I afterward appreciated the facts I learned through the reading process. The cover-art captivated and drew me to choose this book; but the writing itself (while strong and well researched) was a bit of a let down: dry, uninteresting, and hard to get through, with some unnecessary repetition due to its non-linear structure. 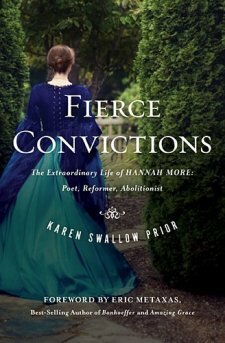 I feel as if I learned the facts about Hannah More, without that personal insight into her person, faith, and the chronology of what moved and influenced her into dramatic action. I would recommend this as a resource for one studying Hannah More, but not as a fun-read for those who enjoy a captivating biography.